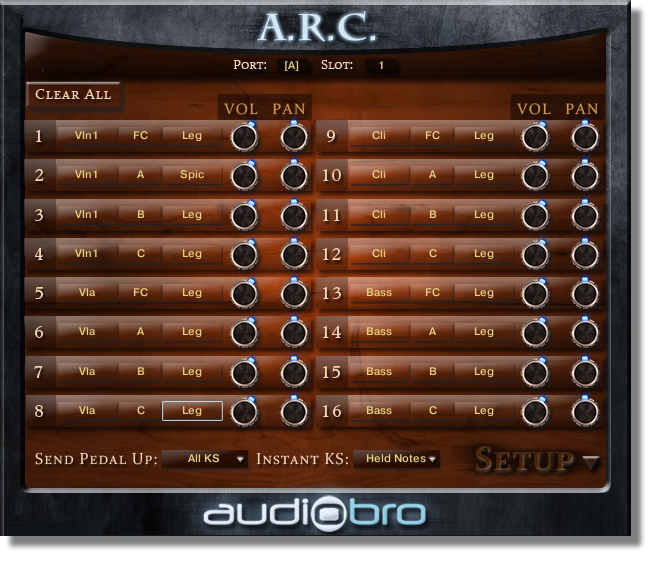 The Setup page is where you tell the ARC which LASS Full patches are loaded into your instance of Kontakt. This is a very important step if you don’t want to be “flying blind” while using the ARC. Since Kontakt doesn’t currently allow bidirectional communication between it’s patches and Multi scripts (the ARC is a Multi script), it is recommended that you take a minute to populate your Setup page with at least the patch names you are using in your instance of Kontakt. Also, from within this page, you can change your patches’ volume and basic Kontakt patch panning. For deeper control of instrument placement and panning, see the ARC Stage & Color page.